Uncle Eddie’s Vegan Cookies are what we feel are the closest to home-baked flavor, and not only that, they’re the absolute best deal for your dollar on the vegan cookie market! Made with high quality and organic ingredients, each bag is a whopping 12 oz. and contains a dozen mini cookies that are sure to satisfy. Available in Chocolate Chip with Walnuts and Peanut Butter Chocolate Chip. Large 12 oz. bags are $6.99 each. Chocolate Chip with Walnuts ingredients: Organic wheat flour, organic evaporated cane juice, organic palm fruit oil, organic chocolate chips (organic sugar, organic chocolate liqor, organic cocoa butter, soy lecithin, organic vanilla), organic brown rice syrup, walnuts, vanilla, soy lecithin, organic molasses, baking soda, organic sweetened cocoa and sea salt. Peanut Butter Chocolate Chip ingredients: Organic wheat flour, organic evaporated cane juice, chocolate chips (organic cane sugar, unsweetened chocolate, cocoa butter, soy lecithin, vanilla bean seeds), organic palm fruit oil, organic brown rice syrup, organic soy lecithin, organic molasses, baking soda, sea salt, vanilla extract (bourbon vanilla beans, alcohol, water). From Anonymous of Springfield, Missouri on 1/9/2018 . If I were on death row I'd definitely have these on my mind. I've had 8 bags and only my last one wasn't soft enough to not need any almond milk. Sweet and a bit salty. From valerie galzerano of vineland, New Jersey on 5/11/2015 . these are so good (choc chip w/walnuts) in the microwave for about 40 seconds. the chips melt and the cookie is warm.... just like fresh out of the oven! i hope they never stop making these! From Oscar of West Bend, Wisconsin on 2/16/2015 . The chocolate chip walnut tastes exactly like chips ahoy cookies but with a lovely salty finish. The plain chocolate chip is a little subtle in its flavor. The peanut butter one is great and tastes like a homemade version. From Marty of Mt.Carmel, Illinois on 12/8/2012 . I absolutely love these cookies. Peanut butter chocolate chip is my favorite. My husbands favorite is the oatmeal raisin. If you try them you might like them too.I too wish all the stores carried them. From Madeline of Baltimore, Maryland on 11/20/2011 . 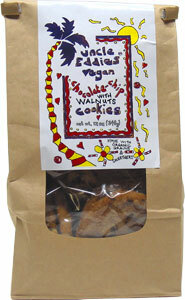 These are my favorite vegan cookies!! They definitely taste home-made. DELICIOSO!! Allergens This item is manufactured in a facility that also processes peanuts, tree nuts, wheat, soy, and dairy products.